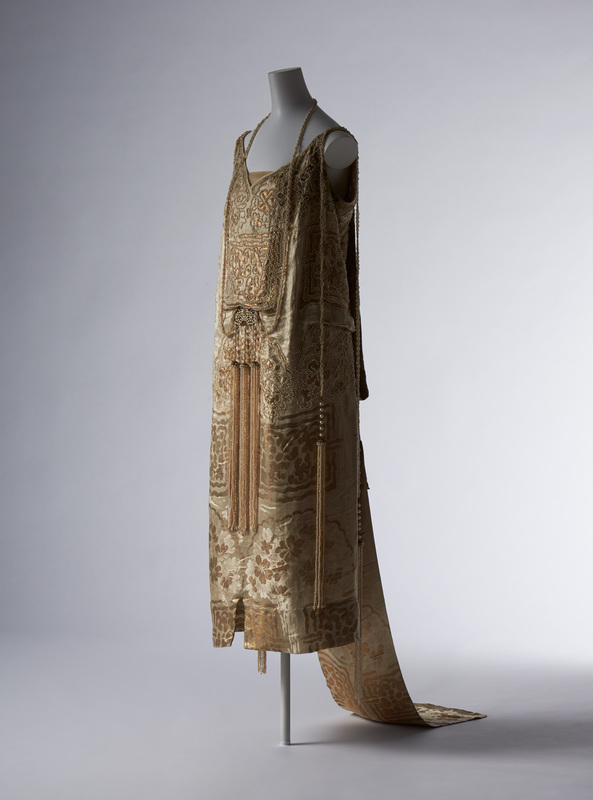 One-piece dress; gold and silver lamé silk brocade with cherry blossom motif; trimmed with bead embroidery; bead tassels on waist and shoulder; long folded-panel train. The straight-line silhouette and low waistline of this dress are characteristic of the 1920s. Despite its simple form, the luxurious textile with pearl beads embroidered along the outlines of its woven patterns and the long tassels give the dress a flamboyance appropriate for Les Années Folles. The textile incorporates abstract compositions combining curves and rectangles, weaving them into motifs of five-petaled flowers that resemble cherry blossoms. The flat structure, almost as if strips of the textile had been sewn together lengthways, and the obi-like decoration trailing from the back demonstrate an admiration for Japanese cultural elements.